Every girl love pink. 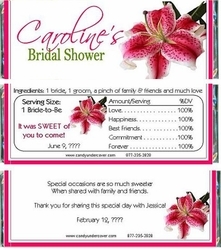 Our STARGAZER LILY CANDY WRAPPER is so pretty and perfect for the occasion. Perfect for Bridal Showers, Weddings and more. Chocolate is the SWEETEST favor and is sure to be a hit at your party!